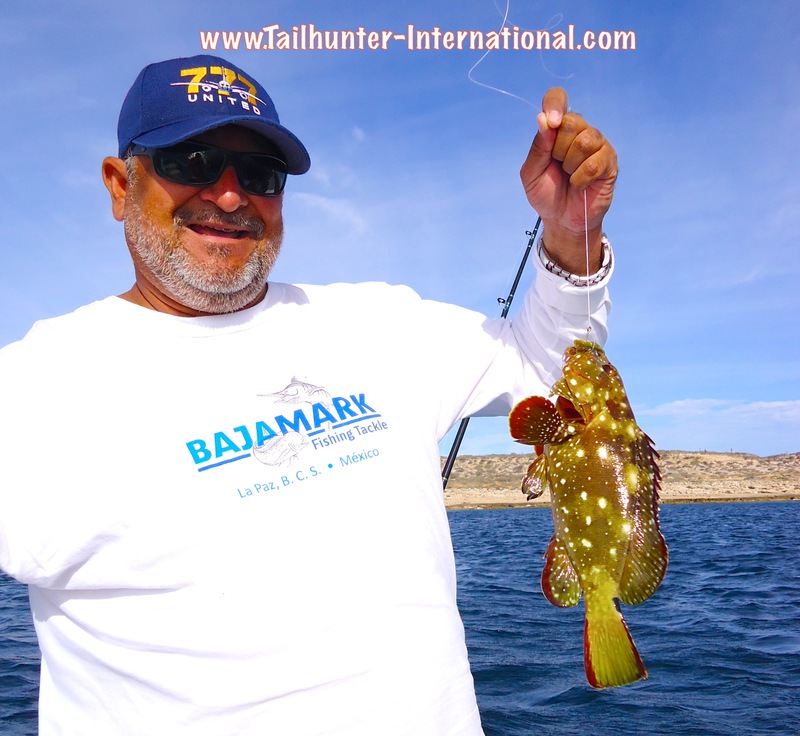 Good amigo, Steve Hartsook, from N. California has been visiting us for years and came down earlier this year than normal finally getting into some nice yellowtail fishing with our Tailhunter La Paz fleet despite some pesky winds. Retired Sherriff’s officer, Verda Boyd, usually comes with her husband, Tim, in December and the way the winds blew this week, it might’ve been about that cold! 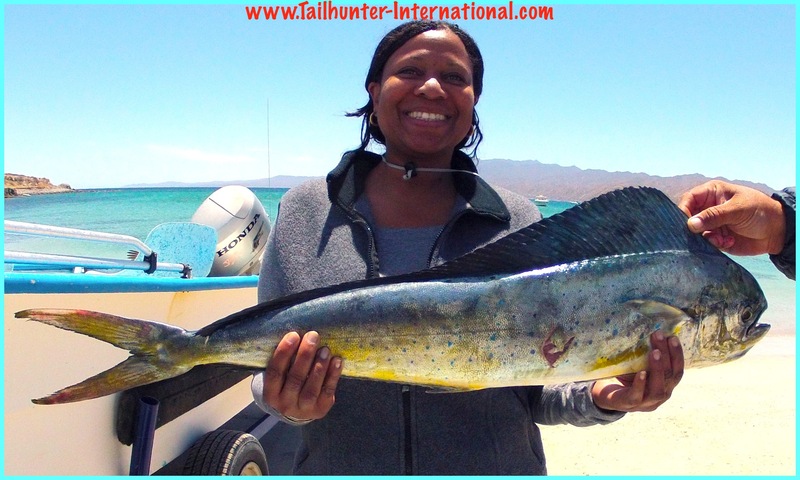 But Verda came without Tim for some yellowtail fishing and produced this hefty forkie fishing off Espirito Santo Island with Captain Joel. Big red pargo lisos (mullet snapper) for Kwame Satterfield who was visiting us from Antioch, CA. 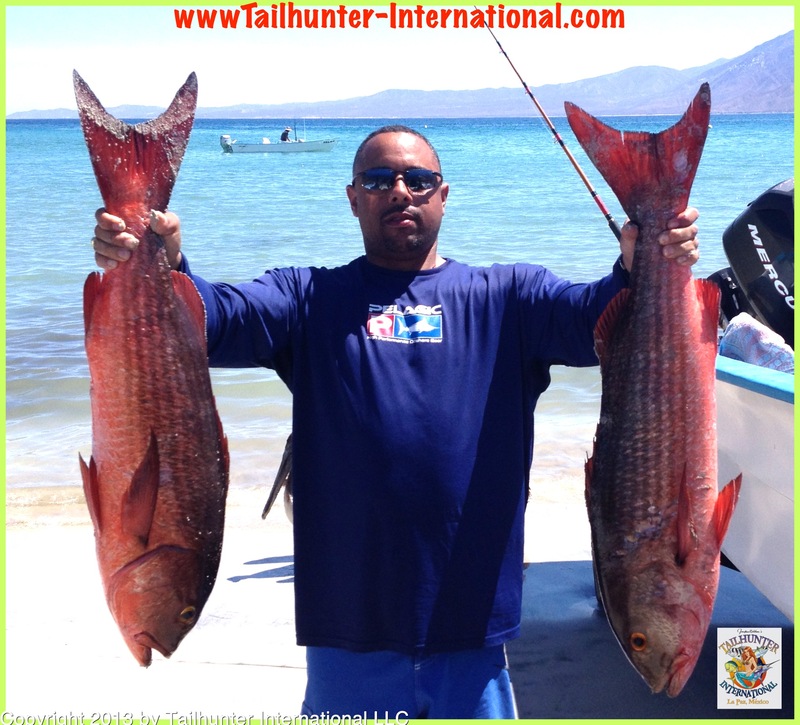 The double catch was taken while Kwame was fishing with our Tailhunter La Paz fleet. He’s posing here at Bahia de Los Muertos. The big snapper/pargo are schooling in the shallows right now. We just started getting some good roosterfishing the last week or two and most of them have been quality pez gallos. Jeff Brown from Minnesota caught and released this beauty off Espirito Santo Island. There have been some good schools showing up with some nice quality fish to start the season. Happy smiles from Yolanda Wheeler. Her first time ever on the ocean…first time ever fishing on the ocean…and her first fish on the ocean…a nice dorado! She was so excited she was jumping up and down in the panga! One of our first dorado of the season also! Far from home, but always welcome, Rod Brown visits us several times a year from distant Wrangell, Alaska! He always does well. 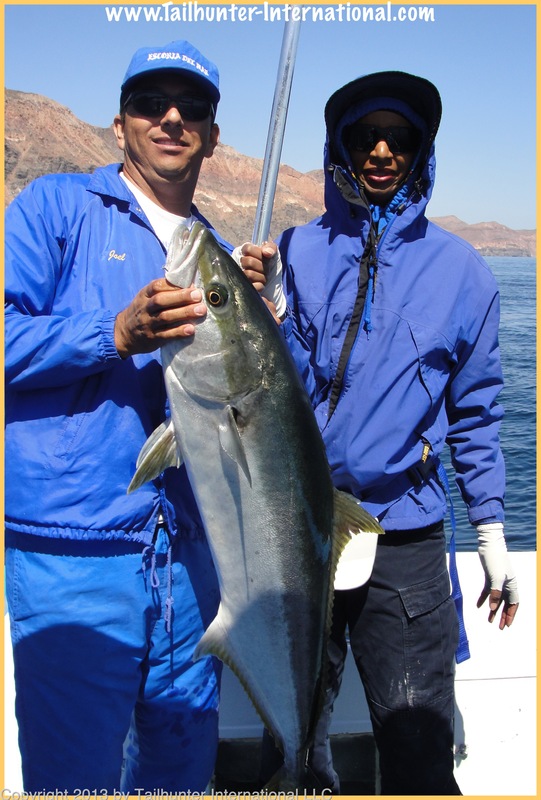 Maybe two of the last yellowtail of the changing season, Rod’s posing with Captain Joel from our Tailhunter La Paz fleet. Jackson, Mississippi in the house! 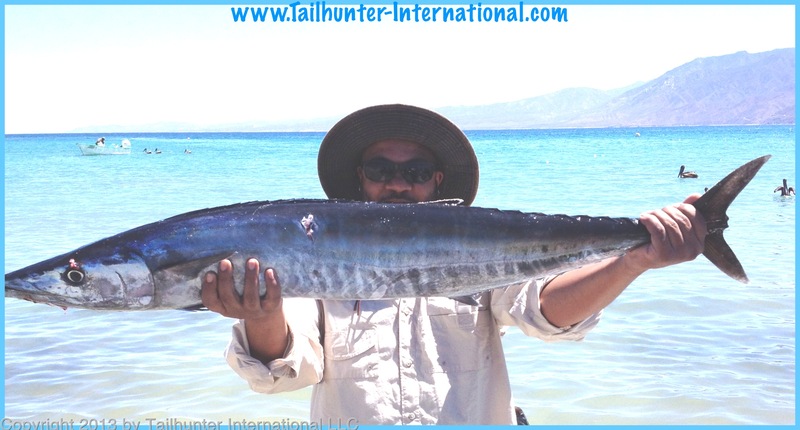 Randall Carrier came a long way to visit us on his first trip and it paid off (just before the winds kicked up) with this nice wahoo on his first day and first day ever! The wahoo was stuck at the south end of Cerralvo Island. 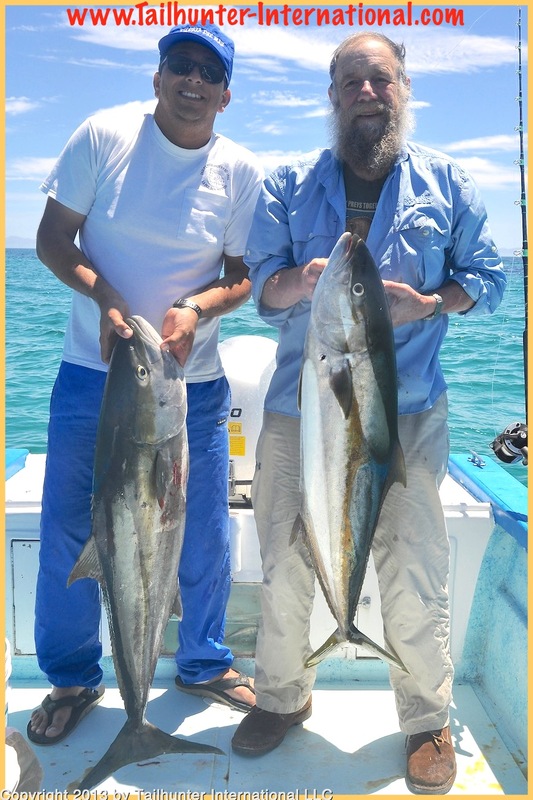 Two of our newest amigos, Chuck Fiola from Washington and Cal Lambert from Colorado have an nice rack of pargo and sierra they caught while fishing off Las Arenas with us last week. 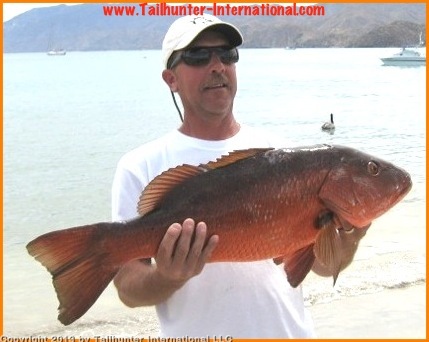 Nice dog-tooth snapper aka “cubera snapper” or “pargo perro”, in the hands of Bob Patterson. PARTING SHOT! When fishing is already tough, don’t complicate it! Our resident amigo and fishing champ had a tough day…then found out later that “someone” had put bananas aboard! This was the only fish caught on the panga all day! For those who don’t know…bananas are bad luck! STRONG WINDS BLOW APART THE BITE ! After such a spectacular week two weeks ago, Mother Nature kicked up again to remind us that there are some things we still can’t control and we really had a difficult week of fishing. The bugaboo winds that really determine all things down here howled and blew demonically and either damped the fishing or outright, kept our anglers off the water. It’s too bad because we were really charging into (what I thought!) 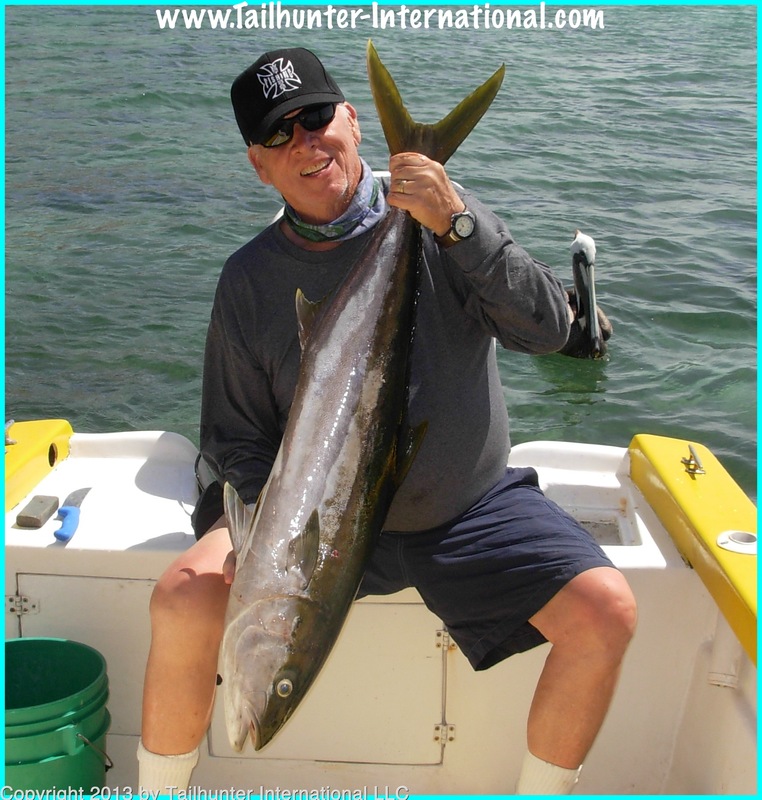 was high gear.The previous week we had our first big tunas…the best wahoo bite in severe seasons…big rooster fish show up…first dorado of the season…big pargo and cabrilla finally kick in…some solid yellowtail still biting…we were kicking up our heels and ready to charge! And then this week came on. As they say…”in like a lion.” The winds roared. Actually, our weather seemed to reflect what much of the west to middle of the U.S. and Canada got…cold temperatures, high winds… One day we just brought all the boats back to shore. Another day we just “suggested” it might not be so good to go out and told everyone to just stay back on the beach rather than get beat up (they had other extra days to make up the missed day). Two of the rare occasions when we maybe could have gone out, but why? Go out and get beat and wet? It’s supposed to be fun. On a few other days, it was just too rough to even get bait or get to the fishing areas. So, this resulted in really slow fishing. So, that was pretty much the story of the week. 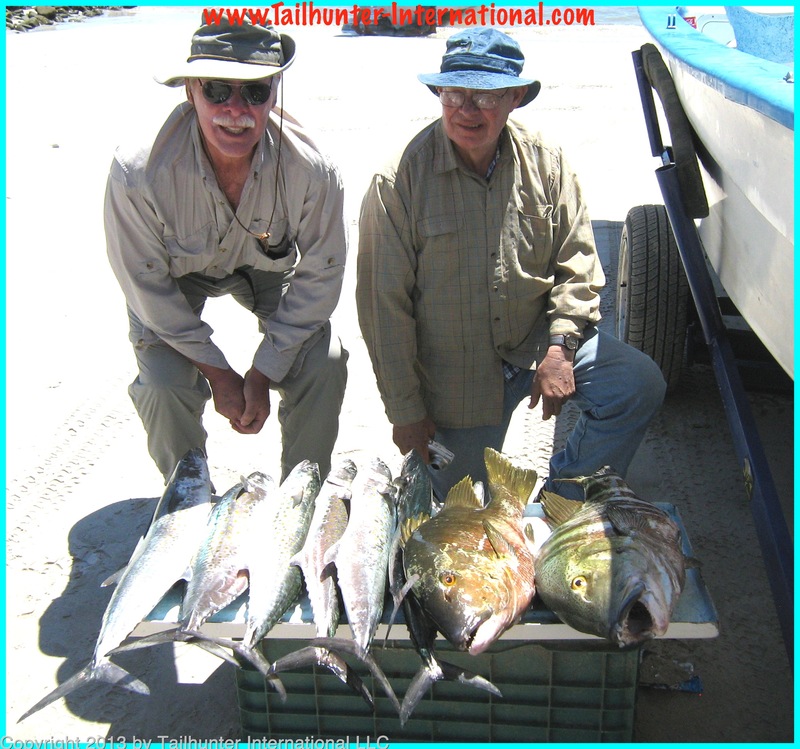 When we did get out, we did get a few yellowtail, some dorado. Some sierra. 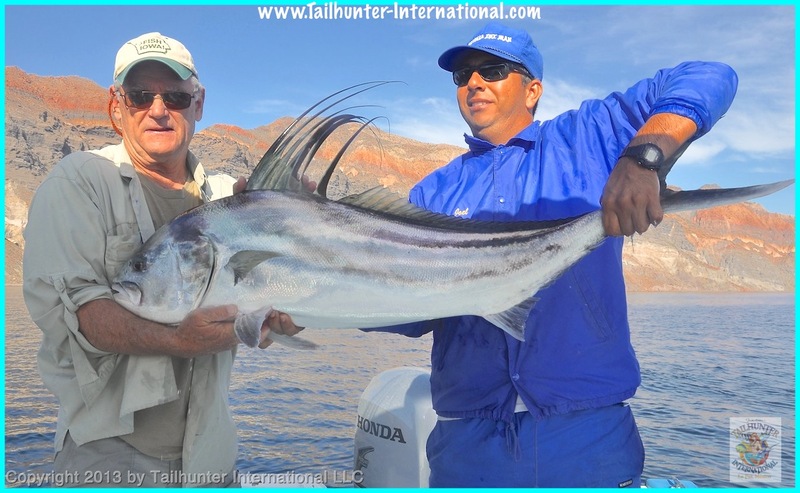 Some nice rooster fish were also caught. We did get two marlin hooked and dropped. As well, some pargo were taken. But, I need to be honest…it was a stinky week. We’ve had better. The good thing about fishing the Baja…it doesn’t stay bad for long. We should turn the corner again…probably by the time you’re reading this.